The village of Sant Miquel de Fluvia is tucked away between Figueres and Girona, not directly on a main road to anywhere in particular, but on the river Fluvia and also on the train line. It's an area of low rolling hills that rise gently above the plain of Alt Emporda, and an area we don't know very well. 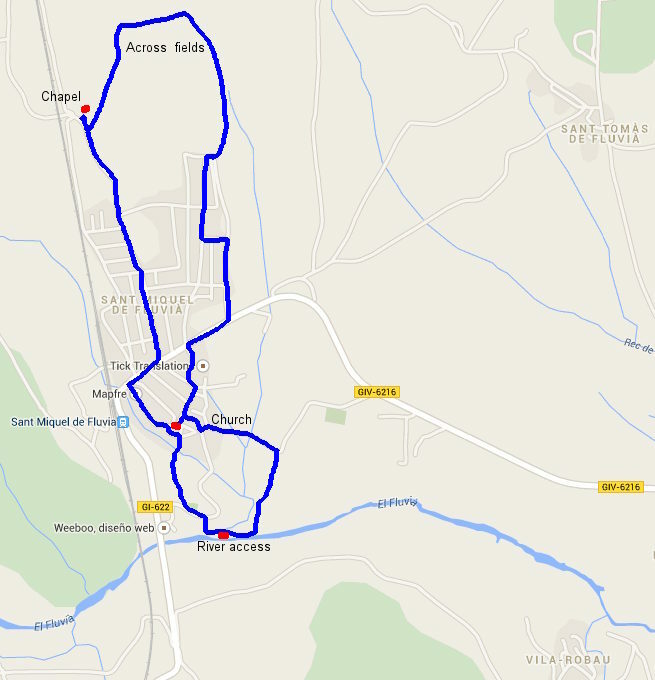 The aim of this walk visit was simply to see what the area was like and to see a village we've not visited before. Our walking route is therefore unlikely to be the best or most picturesque, but gave us a feel for the area. We park just off the main road through the village on the Carrer de Forn Roma, not far from the Embotits (sausage) factory. 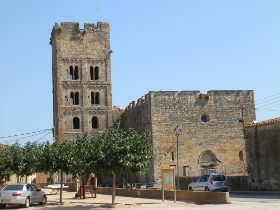 We decide to head for the distinctive 11th Century Romanic church that we could see as we drove in with it's square tower set with open window spaces. The street though has a hidden secret. Just off the footpath in what at first seems to be a font (or even a bus shelter) is a Roman Kiln or Oven. The entrance is actually below street level and it's very dark to see very much at all. We continue along the street and arrive at the church and main old village centre. There is a collection of old farm-house type buildings, the traditional terraced streets and the church standing grandly above them all. Around the side of the church are excavations though we can't tell what for. Before visiting the village though we cut out through an archway towards a spring font in the hill nearby, close to the old safreig (communal area for washing clothes), and seeing a walk through the woods we head down and out towards where we think the Fluvia river is. Eventually though we reach a road and turn back towards the village, before spotting a sign pointing to the river. This takes us right down to the waters edge. 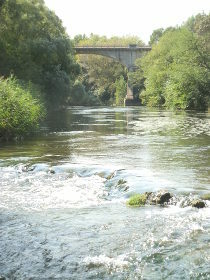 We're in early September and the river is clear and fast flowing and it would be very tempting to take a dip. It certainly looks like the area is used by swimmers or paddlers. We try to follow the river along a marked footpath through the grass that has been cut recently, but it ends in a dead end and rather than retreat the way we came we force through to a path at the bottom of a fenced field and then up past a farm to the road where we re-enter the old village from the other direction. The village has the classic ring of houses for protection and a main street that is never straight. Apparently the curving of the streets was defensive - if you were being pursued the curves mean that the pursuers can't see all the way along the street making it easier for someone to slip out of view and escape. We leave the old village and arrive back at the road through, heading to the right. We could go towards the neighbouring hamlet of Sant Tomas de Fluvia, but instead continue up along the new estate of houses on the hill. Though the countryside is rolling with some views to the distance it's not so pretty and the landscape feels a little unkempt. Leaving the new houses we attempt to follow a marked footpath, only to lose the trail when we meet a ploughed field with no obvious direction to go in. So we cut across the rough fields with extremely sticky grasses clinging to our heels. We find where the path would be for the return trip and walk past the fields and the edge of the woods. Where the path meets the road again, we make a short diversion to see a small tumble-down chapel next to what looks like an old gun emplacement. The chapel looks abandoned but just outside the door is a small bottle with a virgin. We head down back to town. Around us is a another modern estate that falls away to the train line to our right. We had expected more given the presence of the station and the river and though the older part is pretty, and the Fluvia left us itching to go for a dip, the remaining parts of the village were not particular noteworthy.